Bhutan is a fairly small country in the Eastern Himalayas; it is bordered by India and Tibet. It has a population of 634982 and a total land area of 38,394 square kilometer. 72 percent of the country is covered by forest it is global biodiversity hotspot and home to numerous endangered species of animals and plants. 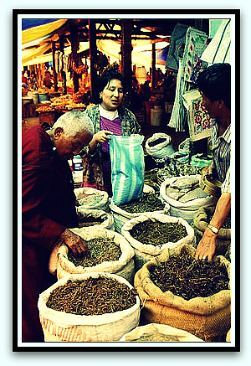 So perhaps it is not so surprising that Bhutan is known as the land of medicinal plants. If you have the google earth plugin, you'll be able to take a better look at the terrain in the map below. Traditional medicine plays an important part in Bhutan's health care. Bhutan has two types of traditional medicine: Sowa rigpa which is the official tradition medical system and local healing practices. Sow rigpa, means "the science of healing". Herbal medicine plays a large part in both medical systems. The medicinal plants are gathered from Gasa, Bumthang and Lingshi in the North and Gelephu, Zhemgang and Trongsa in the southern and central areas of Bhutan. Gardens rich with medicinal plants have been established in some regions around Buhtan. The purpose of the gardens is to promote, preserve and cultivate useful medicinal plants. Two medicinal plants, corydalis gerdae and Aconitum orochryseum has been used by local people for years. Corydalis gerda is used for infections and malaria, aconitum orochryseum is used to treat flu and colds, snake bites, blood infections and fever cause by malaria. Both of these plants have been found to contain antimalaria properties. The government with help from the world health organization set up the Institute of Traditional medicine in 1979 to promote the benefits of herbal medicine and develop it. The National indigenous hospital is one of the departments in the Institute of Tradition Medicine. The hospital offers herbal baths as well as a wide range of services.